Under magnification, every diamond has a unique internal landscape, with tiny features like crystals and feathers that are like an individual fingerprint. Diamonds that are Flawless when graders examine them under 10x magnification, the top of the clarity grading scale, are so valuable and scarce that its possible many jewelers have never seen one. Very Very Slightly Included diamonds, the grade after Flawless, which have only a few tiny features visible under magnification, are rare too. That’s why there are so many clarity grades for diamonds: these almost perfect gems are also valuable. The Gemological Institute of America has six main clarity grades for diamonds with eleven steps in the scale from Flawless to Very, Very Slightly Included, Very Slightly Included, Slightly Included and Included. At the top end of the scale, the distinctions are very subtle. Diamond graders don’t just look at the number and size of inclusions but also where they are located. Diamond clarity is graded under standard viewing conditions with 10x magnification. The grader carefully examines the diamond in order to identify internal clarity and surface characteristics. 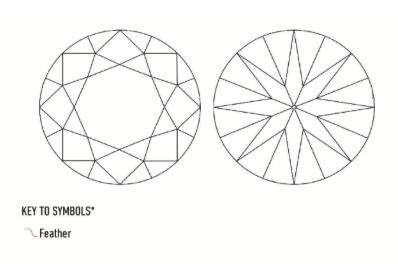 A minimum of two graders assigns their impression of the diamond’s clarity. Tiny crystals and other features enclosed in the diamond when it formed are called inclusions. Surface features on the outside of the gem are called blemishes. Diamonds with no internal inclusions visible at 10x magnification are Internally Flawless. Diamonds that have a minor inclusion visible under 10x magnification are graded “Very Very Slightly Included,” or VVS1 diamonds. Diamonds that are graded VVS1 have a minute inclusion or two that range from extremely difficult to very difficult to see for a skilled grader using 10x magnification. The inclusions in a VVS1 diamond are likely to be pinpoints, clouds or needles. They will generally be small and located in a non-obvious position off the table of the diamond where they will be hidden by brilliance. They may only be visible when looking at the diamond from the side or bottom. You’ll see almost nothing on the plot of clarity characteristics on the report of a VVS1 diamond. Here’s an example. See the tiny feather near the girdle at 2:00? If you gave a diamond dealer a VVS1 clarity diamond, it would probably take a few minutes with a 10x power loupe for that professional to find the pinpoint of an imperfection that is the “Very Very Small Inclusion.” If you don’t use a loupe every day, you’ll probably never find it. It takes training and experience to find these tiny pinpoints in the flashing brilliance of a diamond. It is impossible to see the tiny inclusions in a VVS1 diamond with your naked eye. And you definitely won’t see them when your VVS1 diamond is set in an engagement ring. The dust that naturally collects on a diamond when you wear it will be much more visible than the kind of tiny inclusions that result in a VVS1 clarity grade. Is it worth it to pay the premium for a VVS1 diamond? We don’t think investing in details that don’t make a difference to your diamond’s beauty is worth compromising other factors like cut quality or carat weight. Buying a diamond that has a lower quality grade but still no eye-visible inclusions will leave more money in your budget to buy a larger, more beautifully cut diamond. Should you pay extra for VVS1 diamonds? ROSI doesn’t think the tiny differences in appearance between the top grades of the GIA clarity grading scale are worth the investment. ROSI recommends buying diamonds without inclusions that are visible to the naked eye. Generally that means diamonds with a clarity grade of VS2 and above. But because the visibility of inclusions in diamonds of each clarity grade varies by the size and cut of the diamond and the size and position of the inclusions, there is no simple rule that applies for all diamonds. ROSI automatically takes these factors into account when searching for a diamond with the best possible combination of quality and value.